Preparations for the 2012 APEC summit are transforming Vladivostok’s skyline, but residents of this economically struggling city are worried about what will happen when federal funds run out. In 1959, after a visit to California, Soviet leader Nikita Khrushchev called on the residents of Vladivostok to make it “our San Francisco.” Half a century later, Russia’s leaders are determined to realize his dream as the city readies itself to host the 2012 APEC summit this fall. Similarities between the two cities jump in the face of any first-time visitor: the buildings and streets meandering up and down the hills surrounding Golden Horn Bay; the tramways dotting Vladivostok’s main thoroughfares; Chinatown; a booming harbor on the Pacific and the ever-present morning fog. Vladivostok even has a liberal-leaning political climate – Putin garnered 47.5 percent of the vote here compared to a national average of 63.75 percent. Historically, the gradual migration of settlers from Russia’s more-populated Western regions across Siberia and to the terminus of the Trans-Siberian railroad at Vladivostok was not unlike the American Manifest Destiny. These days Vladivostok blazes with welders’ flames as cranes dotting its hilly downtown reflect the billions of dollars the federal government is pumping into the city ahead of the APEC summit, scheduled for September. The development of the remote regions of the Far East will be discussed during the APEC CEO Summit 2012. The narrow, potholed road from the airport has been raised up to 10 feet in some areas and expanded into a modern, four-lane freeway; the new airport is scheduled to open this summer. Two Hyatt hotels are under construction, monuments, roads and facades have been repaired, an express train line from the airport to the city center will soon open and a new drama theater is almost finished. One of the most impressive projects nearing completion is the bridge to Russky Island – the closest island to Vladivostok – and new campus for the Far Eastern State University. The 2-mile-long bridge, partially held up by masts standing on two artificially constructed islands, was started less than three years ago. The central mast reaches a height of 1,050 feet. When completed this summer, it will be the longest cable-stayed bridge in the world (price tag: $1 billion). Russky Island houses defense installations and is home to several thousand retired military men and their families. It was a quiet, off-limits district until then-President Vladimir Putin supported a plan to merge four of the major universities in Vladivostok into a single institution and house it in a new campus. To say that an entirely new city has been erected in less than three years is no understatement: a previously empty 160 hectare plot of land has been developed into roads, dormitories, cafes, gardens, stadiums, hospitals and what is expected to be the world’s third largest oceanarium by between 8,000 and 16,000 mostly Central Asian laborers working round-the-clock. Authorities hope the impressive campus and generous state grants provided to federal universities will attract the brightest minds from around the world and establish several strong schools in fields like biomedicine and I.T. Plans for a technopark to commercialize products coming out of the university and create additional jobs are in the pipelines; a Special Economic Zone for tourism may be set up on Russky to take advantage of the lush beaches, which students of the University will have at their disposal). But the success is mostly dependent on the hordes of construction workers rebuilding the city. All contact with the workers has been strictly off-limits to journalists. A dark, even less visible story has to do with the region’s demographic decline. Over the last 20 years, 300,000 people have left for more hospitable regions of Russia or abroad – that’s half of Vladivostok’s already sparse population. In mid-March, a crowd of eager journalists crowded in the 1st floor marble hallway of the towering white-colored State House in downtown Vladivostok amid typically dreary morning weather. They were awaiting the results of the legislature’s vote over the candidature of the 44-year-old Vladimir Miklushevsky for the post of governor. The previous governor, Sergei Darkin, had been abruptly dismissed by President Dmitry Medvedev just weeks earlier after a decade in power. The news came as a shock to many locals, who credited him with lobbying through many of the federal funds pouring into Vladivostok. 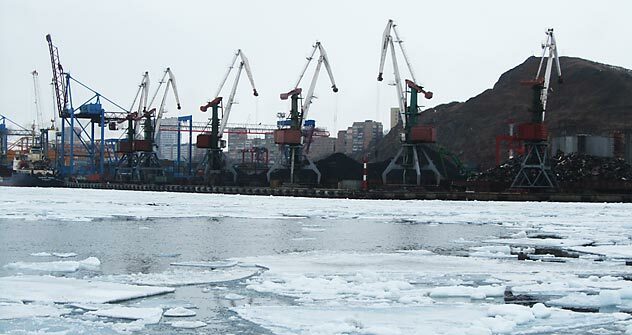 "The APEC summit will have a direct impact on the long-term development of Vladivostok," Miklushevsky told RBTH. “The 200 billion rubles (nearly $7 billion) of federal funding coming here will improve infrastructure, a lack of which is a barrier to investment (not only in Russia). It also put Vladivostok on the world map and make it known throughout APEC. We can't miss this opportunuty."